This was sure an interesting weekend weatherwise as an extremely early season “arctic front” (leading edge of cold and dry air) dropped south, west of the Cascades, to around the Twin Cities and then fell apart Friday evening as it passed farther south through Kelso. That’s about what we expected. That gave a dusting (or more) of snow to parts of Puget Sound. Then an area of low pressure at the surface moved across southwest Washington last night and this morning, bringing a gusty southerly wind to all areas west of the Cascades in the KPTV viewing area. On the north side of that low, snow fell all the way down to sea level in spots today. So Puget Sound ended up with 2 little “snow events”. One could argue that it’s now SEATTLE 2, PORTLAND Zero for this “winter” so far. 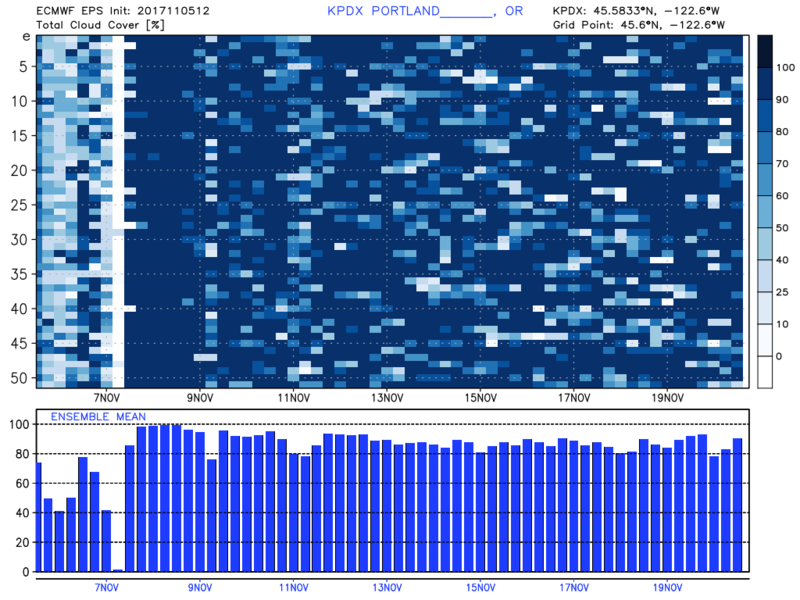 The ECMWF model was by far the best forecasting this event; you may remember the GFS and even the GEM models kept showing today’s low coming right down into NW Oregon to our south. Well, we now know that COULD have brought snow all the way into the metro area (or for sure the Gorge) IF those models would have been correct. A surge of cool air (and high pressure) will pour south into Eastern Washington tonight and give us a 2-3 day period of strong easterly wind through the Gorge and into the east side of the metro area. That begins Monday afternoon and continues all the way through Wednesday. This will be the first “cold” east wind of the season. Highs will only be in the 40s, compared to low 60s with the wind last week. Quite a change! Keep in mind you can not go to Vista House to experience the wind through the foreseeable future. Fire never made it to that location so I’m not sure what the reason is for keeping the road blocked 1/2 mile before that point. Rumor says that MAY be the situation the entire winter. We’ll see. But the good news is the dry easterly wind will give us two dry days…Monday and Tuesday. Enjoy, because we’re going into a rainy pattern starting Wednesday and continuing through the next 10+ days. 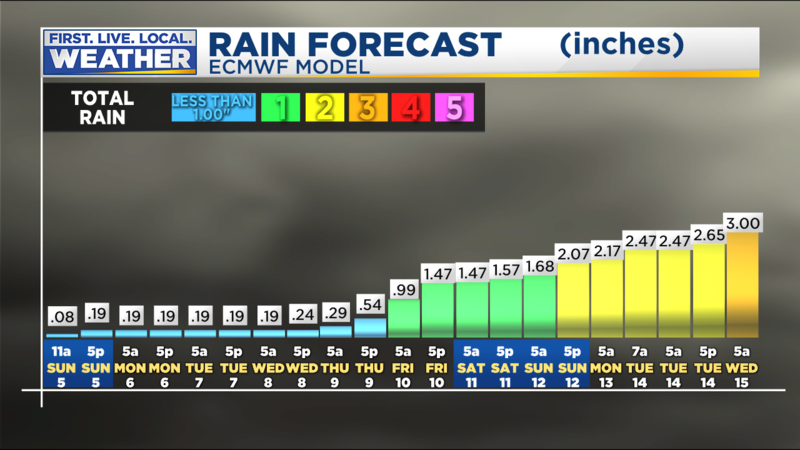 Take a look at the ECMWF ensemble 24hr precipitation forecast. Each horizontal line across the top is one of the 51 ensemble members. 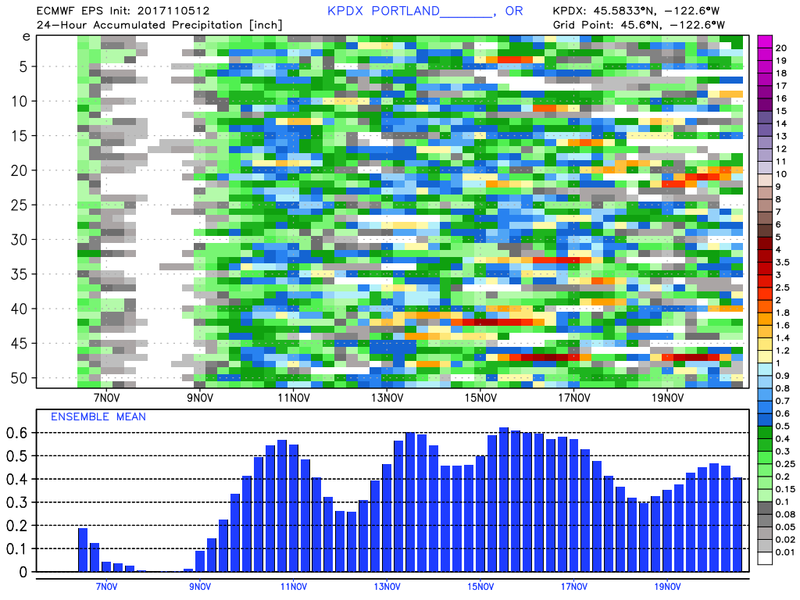 The lower blue part is the ensemble average, showing several peaks of precipitation forecast. The only real obvious breaks in there are the next two days. But it gets gloomier; check out the cloud cover forecast for the same period. There IS some good news if you are a skier. 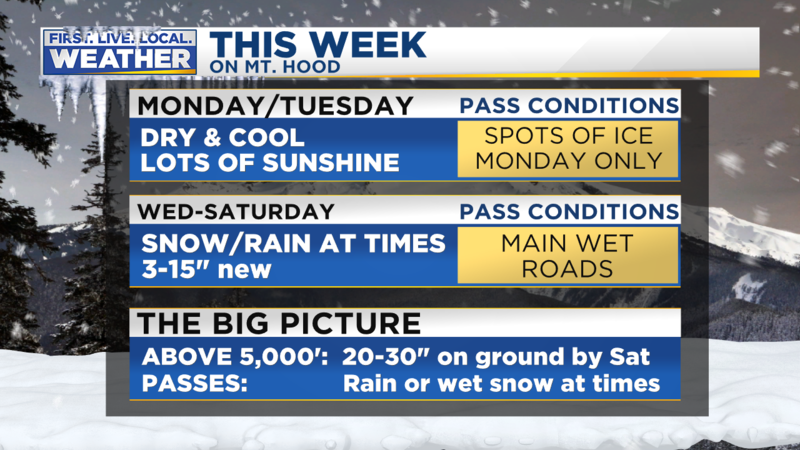 Snow levels will rise after tomorrow, and linger in the 4,000 to 5,000′ range through most of the next week. The result is additional snow base-building at the top of Skibowl and a good part of Timberline and Mt. Hood Meadows ski areas. I think there should be a solid 2 feet or more on the ground in those locations, not just fresh snow but a building base. This is a good sign that we might have a good start to the ski season like last year. #FingersCrossed. Down at Government Camp it’ll be a mix many days during the next week so you folks will likely lose some of your 10-12″ on the ground right now. So there’s no sign of a real stormy pattern (wind or flooding), and no sign of low elevation snow or freezing rain in the metro area. Now depending on how cold the airmass is in the eastern Gorge Wednesday, it’s possible we get either snow or freezing rain out there, but we’ll see about that. Might just be up in the higher valleys away from the towns. More on that in the next two days. This entry was posted on Sunday, November 5th, 2017 at 7:09 pm and is filed under Weather. You can follow any responses to this entry through the RSS 2.0 feed. Both comments and pings are currently closed. It sure seems like our November weather has reverted back to more like we used to get here in the ’80’s….back then outdoor work definitely became harder and more trying with the cold rainy November weather…..but the last 20 years or so I have found that Novembers have seemed milder and somewhat easier to work outdoors in. But the last few days have been cold on my face and a reminder of those cold Novembers of time gone by. Just checking in on the lovely Oregon weather. I relocated to the foothills of the Santa Monica Mountains so now I’m Dave in Newbury Park (‘1000). It gets boring when the weather is basically summer every day so weather is not closely followed here. I won’t be like that guy that moved to San Antonio bragging though. Now I’m just a lurker… Its been a pleasure following your blog all these years Mark. Crazy looking sunrise this morning. Wow. Overnight Overnight low didn’t happen as predicted in Hillsboro. Will it happen tonight? 41 in Hillsboro. What happened to the near freezing temperatures? Rod, I believe, is a really nice person and TV personality. True meteorological skills, however, I would not bank as his forte. Rod Hill’s forecasting career has spanned nearly 30 years, taking him from the hurricanes of south Texas to the lake effect snows of Michigan, the tornadoes of the Ohio valley and yes, the hard to predict weather of the Pacific Northwest. Rod grew up in Missouri and graduated from Mizzou. He later earned his certificate of broadcast meteorology from Mississippi State. Soon after, Rod earned the seal of approval from the American Meteorological Society and the National Weather Association. He later served on the NWA certification board for more than five years. Arriving in the Northwest in 1999, Rod has been honored many times for his forecasting expertise and on-air broadcast style. His forecasting achievements include two Emmy awards for best meteorologist and three Associated Press awards for best weathercast in Oregon. A helpful word of advice; Stick to your knitting son. First snow tease in the hills of the Gorge this morning! A full 12 hours before the official midpoint of Fall! Clear skies this morning, and we had an overnight low of 24F. However, that’s likely to be the coldest temperature here for at least a week. By the way, Garrison, I don’t live near Portland, but in Canada, in case you’re wondering. Overcast all night here, held the temperature to 33˚F. It’s burned off and it’s beautiful blue sky now. Gotta get out and take a hike somewhere.